Last Con of 2018 – Jacksonville Part I Friday and Saturday! 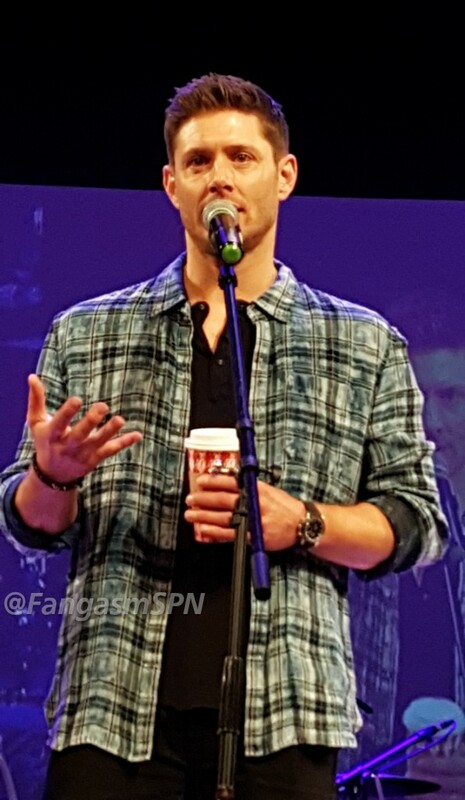 It’s the end of 2018, so it seems fitting to share some pictures and memories from the last Supernatural con of 2018, which happened to be in Jacksonville. I wanted to end the year with everything that’s positive about fandom and a reminder to myself as much as anyone of how much I love and enjoy this incredible cast and all the fans I’ve had the pleasure of meeting and hanging out with over the past decade plus. 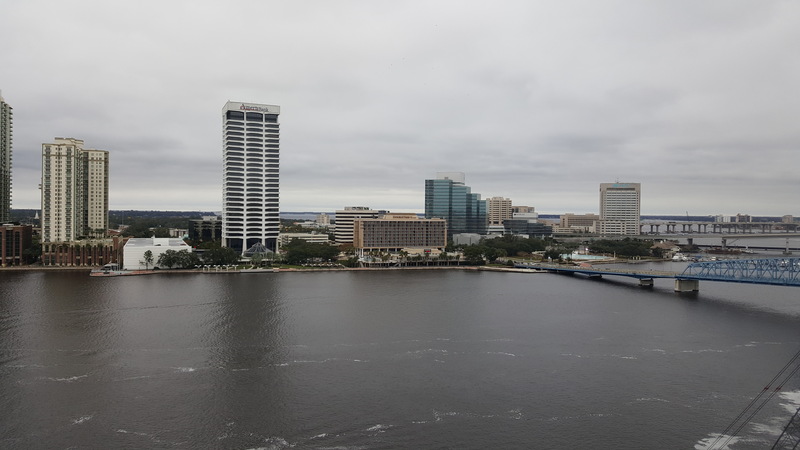 So here’s Part I of Jacksonville 2018, with some pretty pictures to brighten your last day of the year! The hotel was under construction, which meant the beautiful view of the water was obstructed when you were at ground level, but luckily the vendor room was elevated with floor to ceiling windows, so the view from my table was breathtaking (if you just look past the various cranes and things). And from our hotel room and its teeny tiny balcony? Even better. 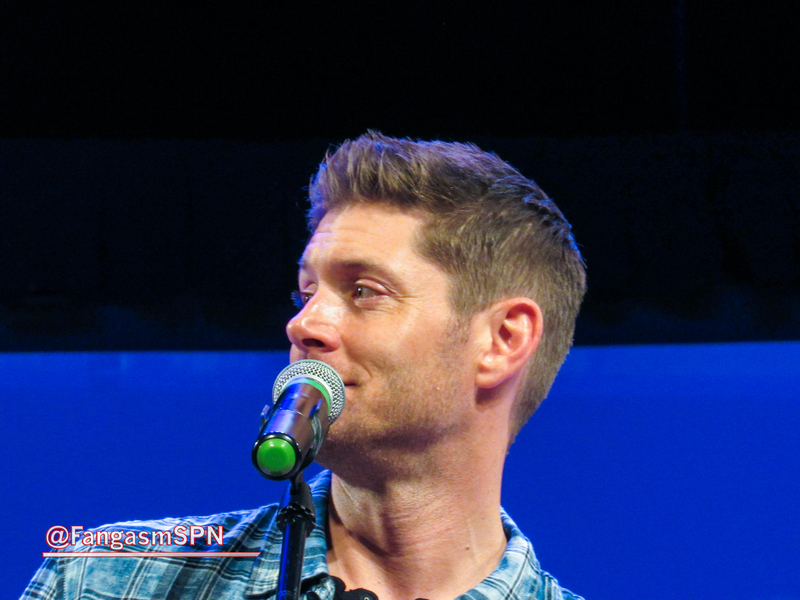 My good friend Alana was also at Jaxcon, so we took advantage of both being in town early to go have some lunch. We managed to find a restaurant that was 100% empty, and since we were the only ones there, of course that meant blogging and putting Africa By Toto on the jukebox. And then more blogging. And corn nuggets. Don’t knock ‘em if you haven’t tried ‘em! 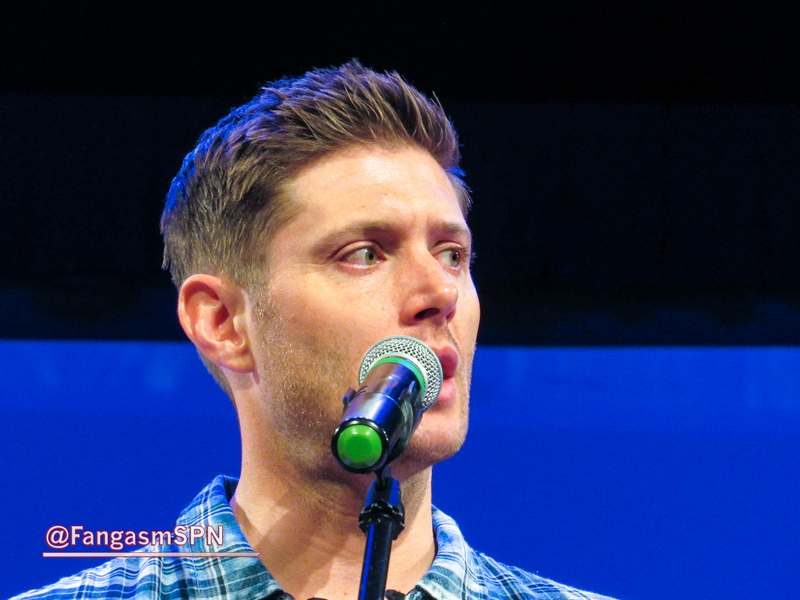 Lots of my favorite SPNFamily friends were also at Jax, so it was a fun four days with lots of catching up and goofing off and not getting enough sleep – but hey, that’s what cons are all about! Jacksonville with Alana (and Lynn)! 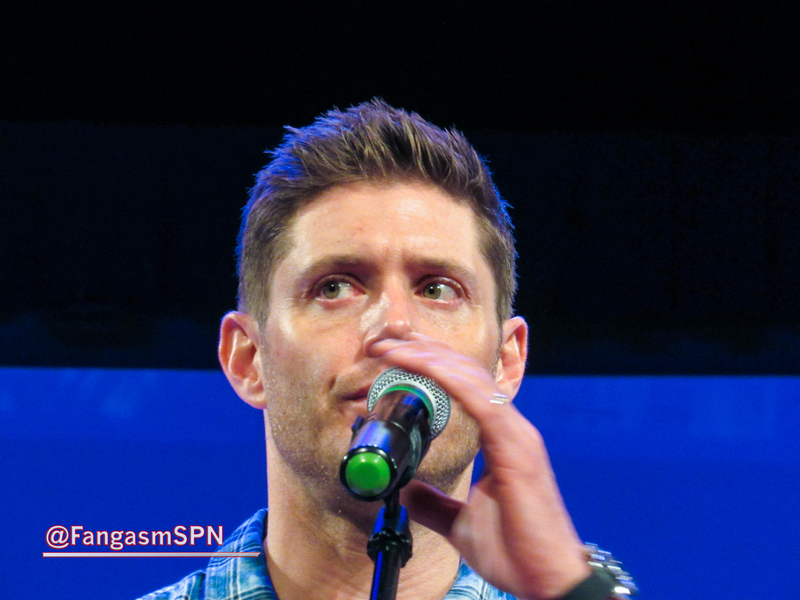 I’m just going to include some highlights in this blog, since the panels were broadcast on Stage It and I’m assuming most of you have had the pleasure of watching them by now. 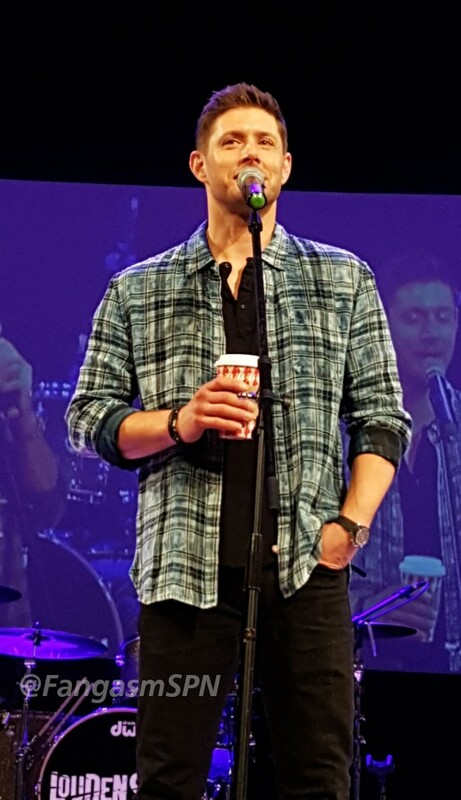 This is Part I, with Misha Collins, Rachel Miner, Kim Rhodes, Briana Buckmaster, Ruth Connell, Adam Fergus, David Haydn-Jones, Emily Swallow, Rob Benedict, Richard Speight Jr, Matt Cohen, Mark Pellegrino and a special appearance by Hayden Lee too. Phew, that was a jam packed Friday and Saturday! Rachel Miner had a great answer when someone asked how she manages to keep her great attitude and beautiful soul? The holiday season is here! 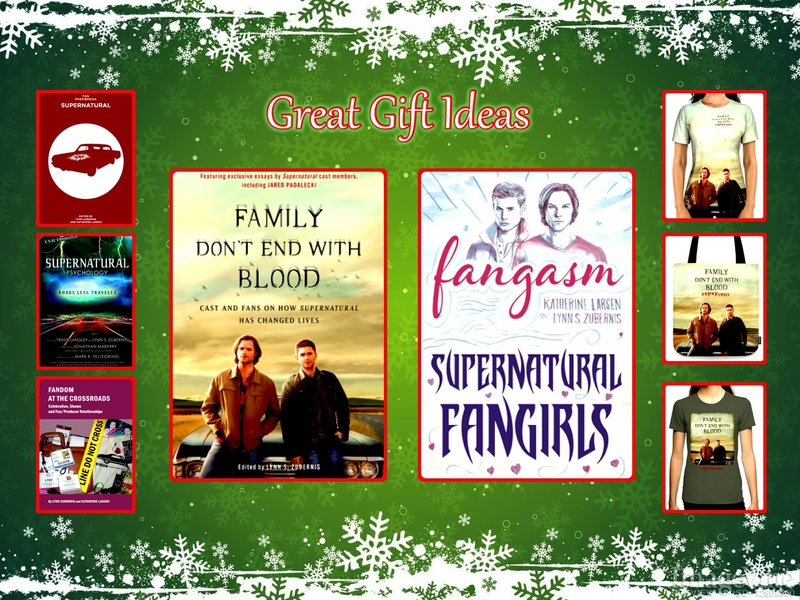 If you have a Supernatural fan on your list (or you’re making a wish list for yourself because really, you deserve it! 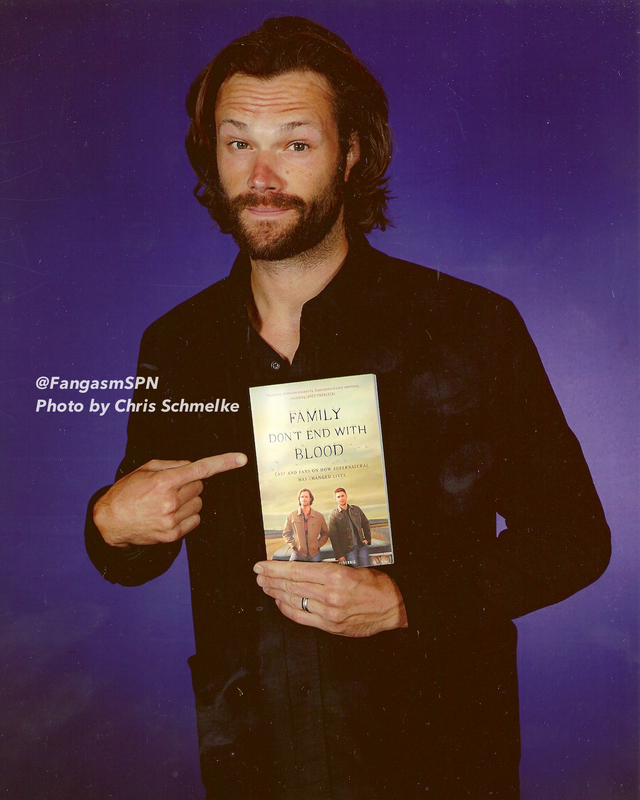 ), then one of our Supernatural books just might be the perfect gift this holiday season! 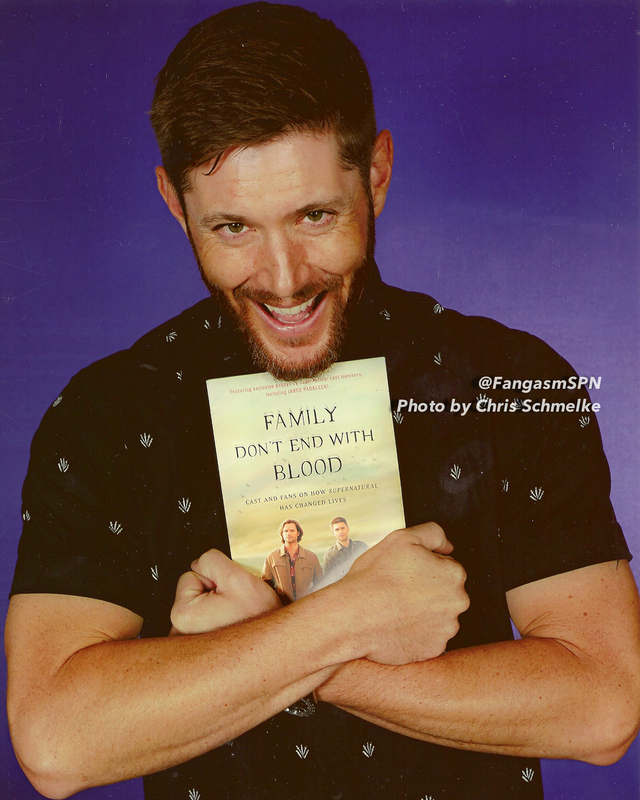 From Family Don’t End With Blood to Supernatural Psychology, we have several books to choose from, plus other FDEWB merchandise such as t-shirts, phone cases, tote bags and more. Many of the books are now at special holiday sale prices. All the information you need – plus links to take you right to ordering – below! 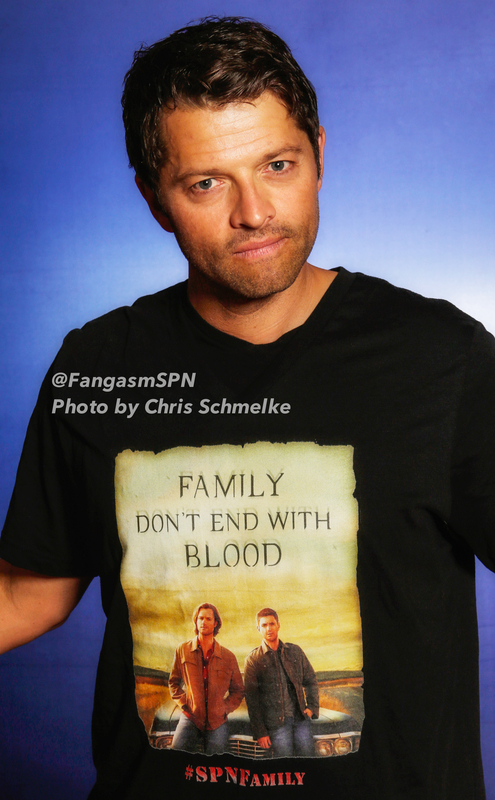 Family Don’t End With Blood – This is the only book actually written by the Supernatural actors. 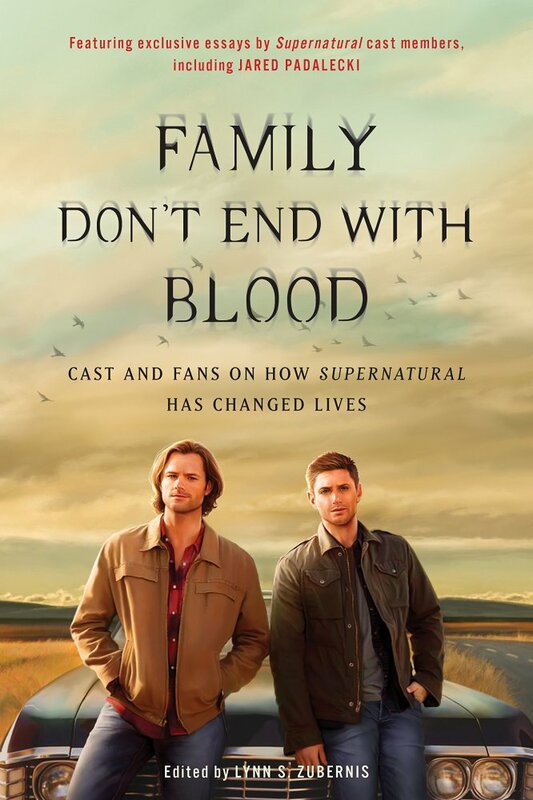 Jared, Jensen, Misha, Kim, Briana, Ruth, Rachel, Mark, Matt, Rob, Osric, Jim and Gil (plus a dozen Supernatural fans) all share their stories of how being on Supernatural and part of the SPNFamily has changed their lives. We’re so grateful to the actors for their courage and candor in sharing such personal stories of how they’ve grappled with depression, anxiety, and self doubt and found the strength to take risks and keep fighting thanks to the support of the fandom – and to the fans for sharing their stories of how the actors and fellow fans inspired them to do the same. We love hearing that reading this book has inspired others to keep fighting too – and every purchase benefits Random Acts and Attitudes in Reverse to help make a difference! Click Here to Order! Did you know there’s also FDEWB merch? If you love the book or love the cover art, we have a shop on Society6 with a variety of products, including t-shirts, totes, mugs and more featuring the beautiful cover design by talented artist Cris Griffin. 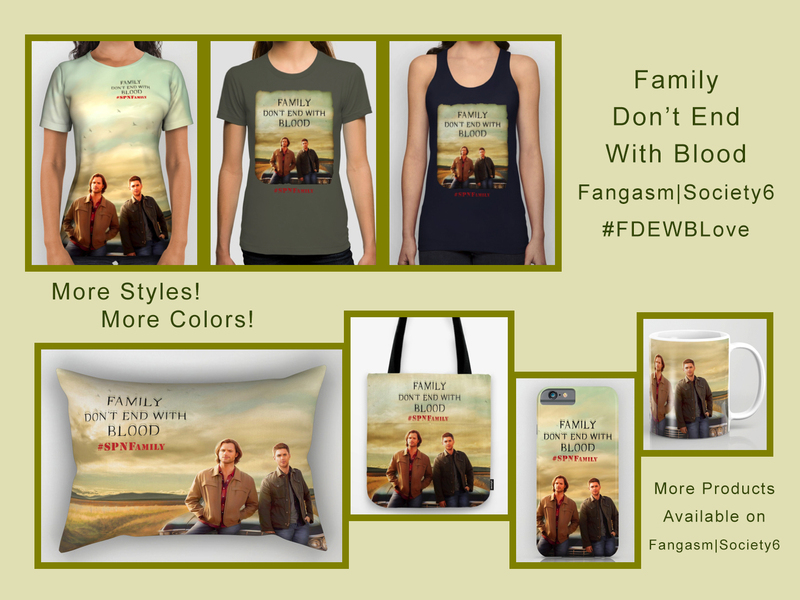 Order here (instructions for how to see ALL the many FDEWB products are at the top of the page) Click Here to Order! 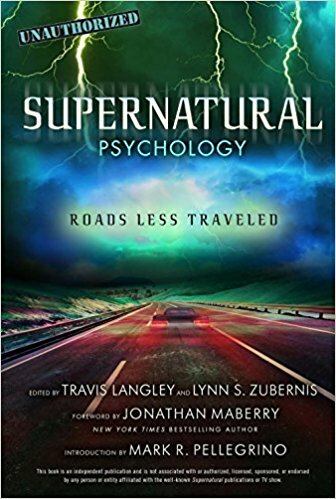 Supernatural Psychology – If you’ve ever tried to figure out why Supernatural is the best show ever, then this is the book for you. 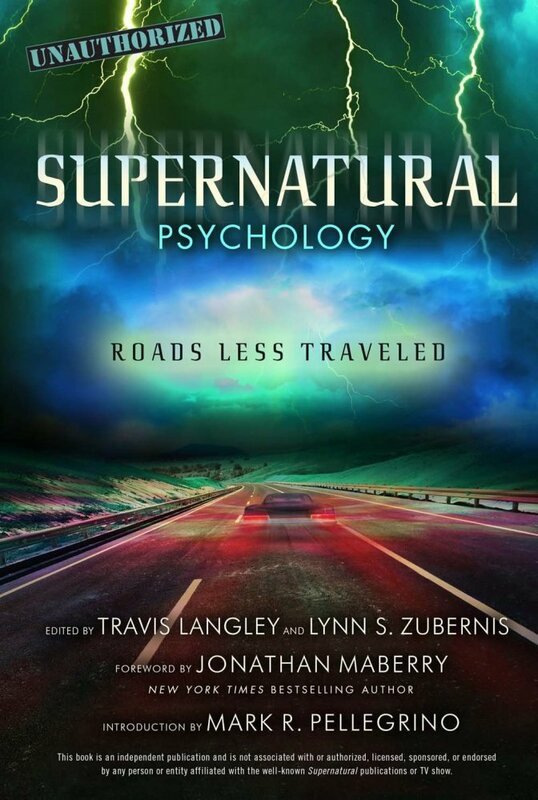 Written by a variety of psychologists who are also fans of the show, this book explores how the Winchesters, Castiel and many other characters deal with the challenges thrown their way, and what drives these characters to always keep fighting. 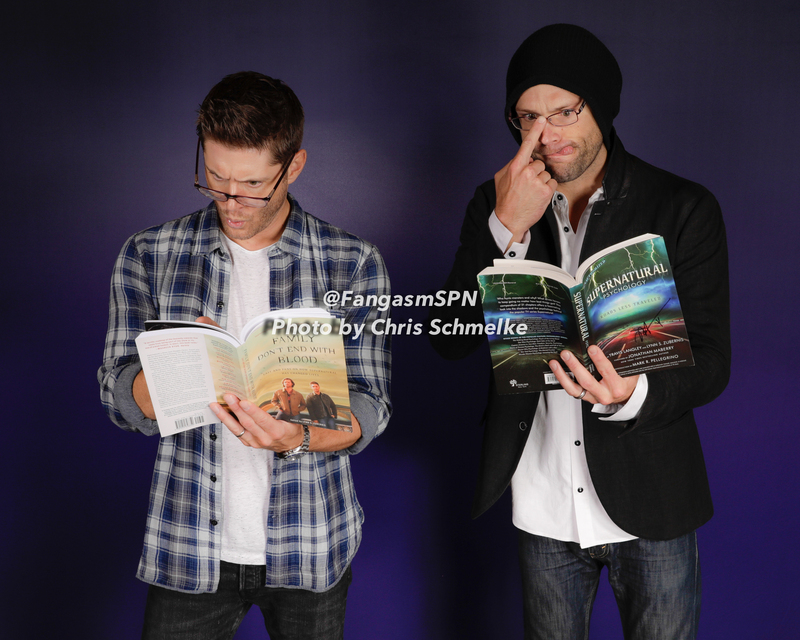 The book also includes a moving introduction by Mark Pellegrino (Lucifer). 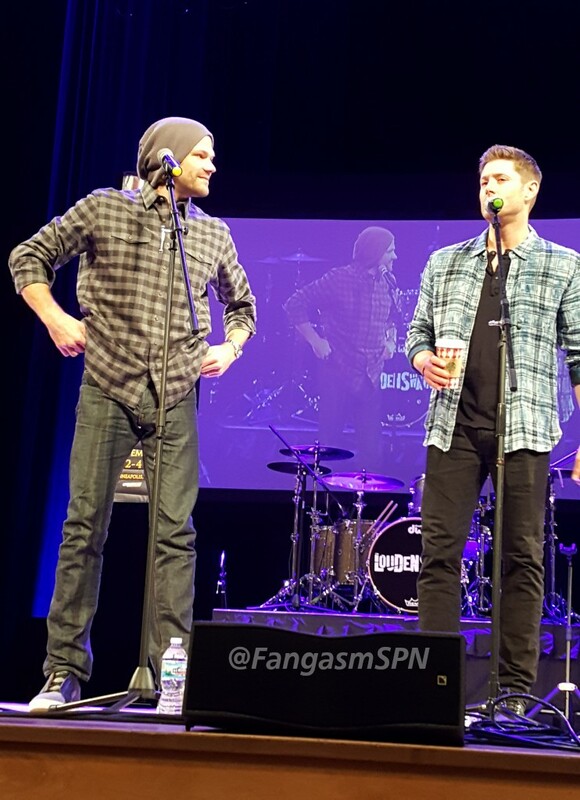 Minneapolis Supernatural Convention 2018 – Sunday with Jared and Jensen! 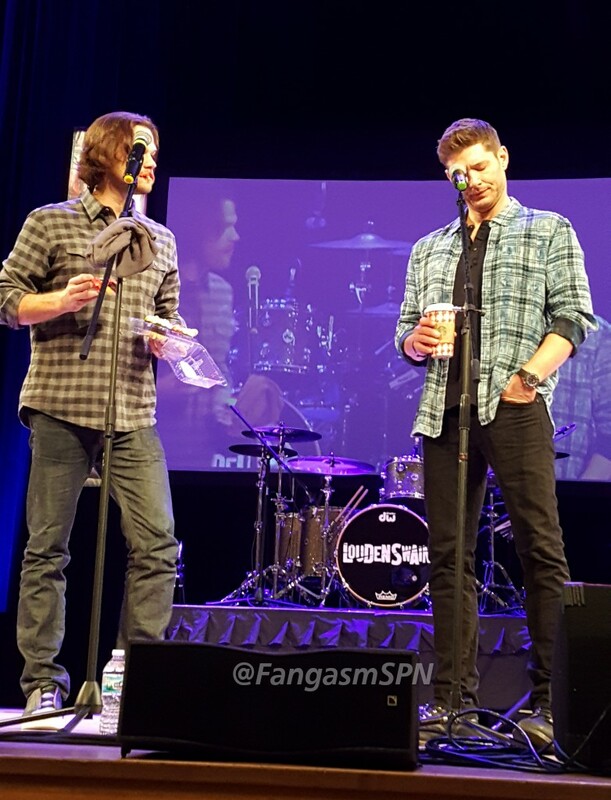 Sunday was, as always, J2 day. 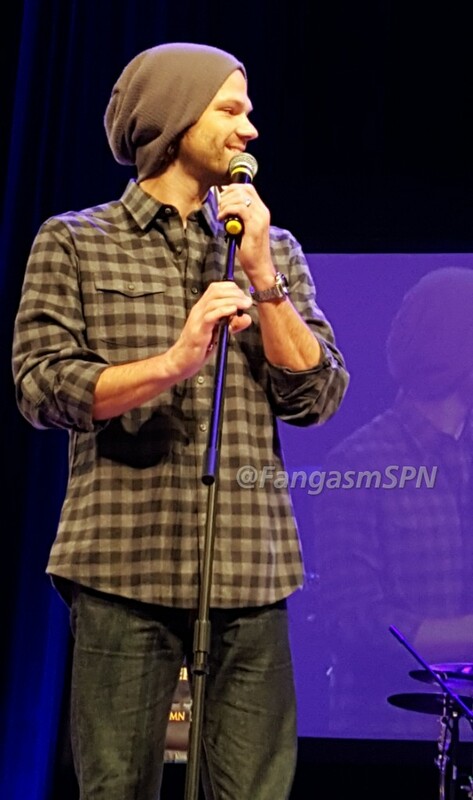 The Jared and Jensen morning panel started out with a sad story of how Jensen hurt his knee training for the Bad Idea marathon with Jason Manns. Good friend that he is, Jared took a picture. 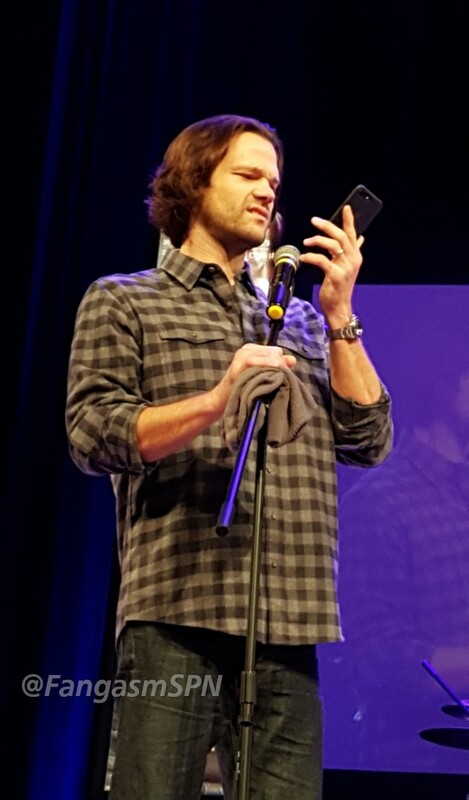 Jared: I took a picture of Jensen from the waist down with ice on both his knees and sent it to our guy friends and they were like, why’d you send this? 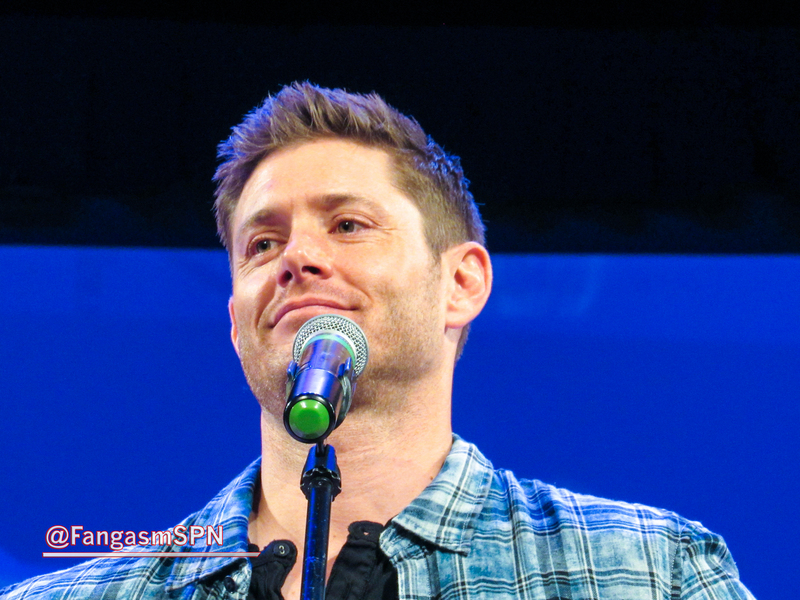 Jensen: No, they were like, why didn’t you show more? 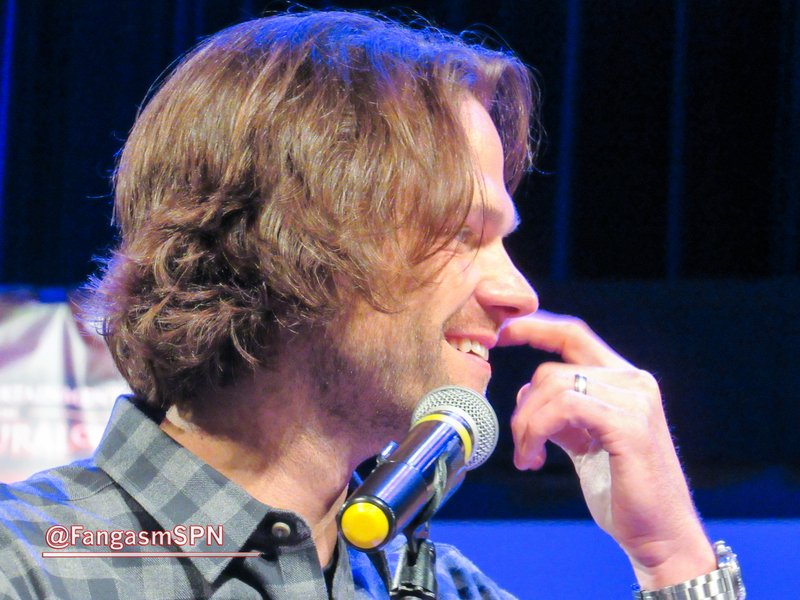 Jared got a spam call and made a face, which prompted Jensen to give a talk about how to deal with unwanted sales calls. Which was just proof that these two can make any topic hilarious. And nice to look at. To dropping the entire tray on the floor. 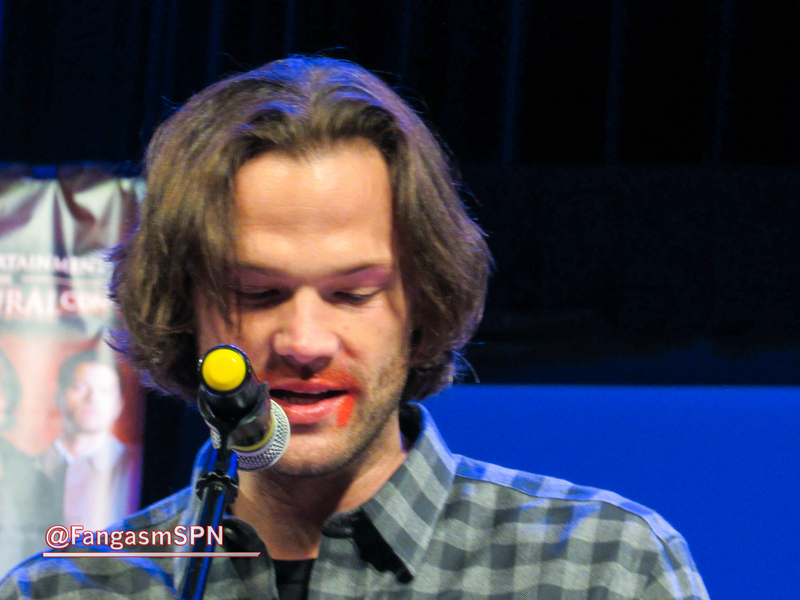 There was red icing everywhere, including all over Jared’s face! While handlers swooped in to try to clean up, Jensen made Jared crack up even more by muttering that “you look like you just fellated Ronald McDonald”. What could be more perfect for Halloween than talking with the director of some of the scariest projects out there? Eduardo Sanchez burst onto the film scene in 1999 with the innovative and terrifying Blair Witch Project. 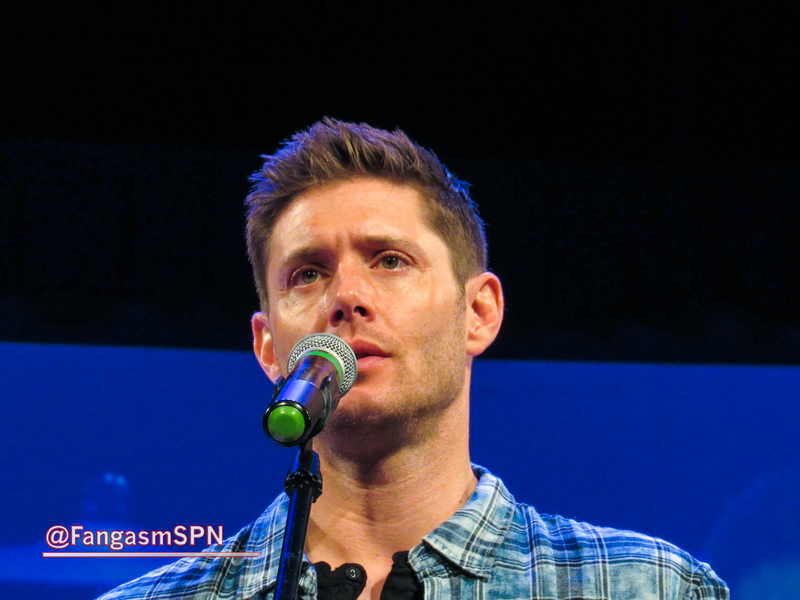 He has gone on to direct in film and television, including my favorite show of all time, Supernatural. I am fascinated by every aspect of creating the Show I love, because if there’s one thing that has become very clear to me after researching and writing about that Show for over a decade, it’s that Supernatural is a collaboration. 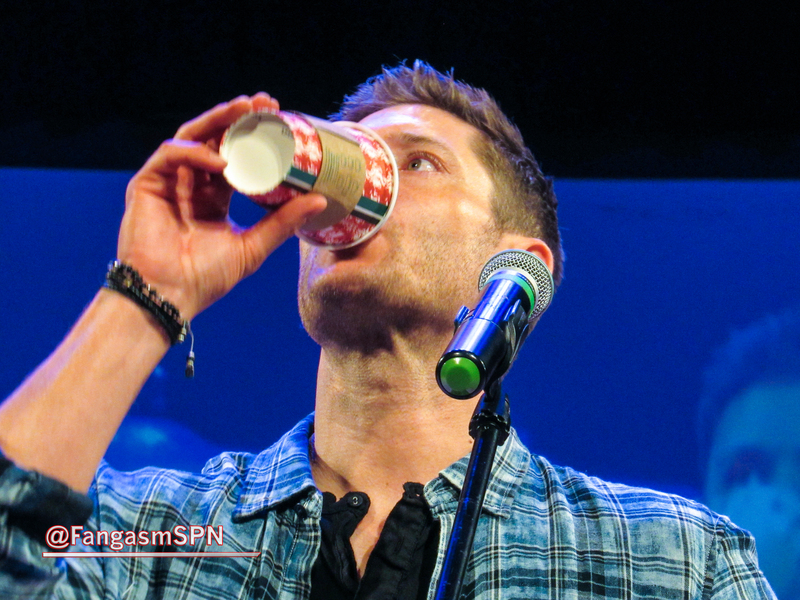 It takes top notch writing, set dec, locations, cinematography, make-up, special effects, producing, acting and directing (among a multitude of other things) to make Supernatural the special thing it is. So I’m always genuinely interested in the perspectives of all the many people who contribute to that collaboration. 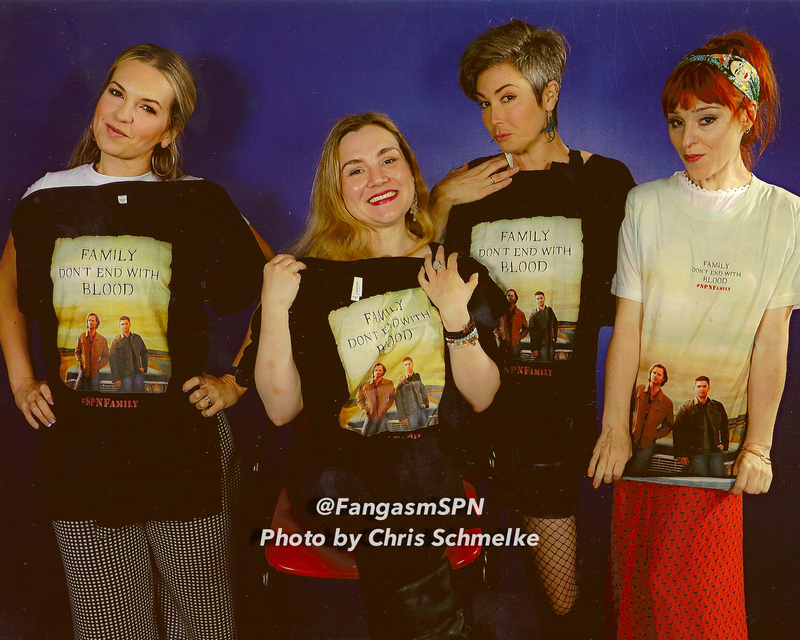 I loved hearing the actors’ perspectives when they wrote chapters for Family Don’t End With Blood and the insights of director of photography Serge Ladouceur in Fan Phenomena Supernatural and all the contributions that everyone on the set shared in Fangasm Supernatural Fangirls. 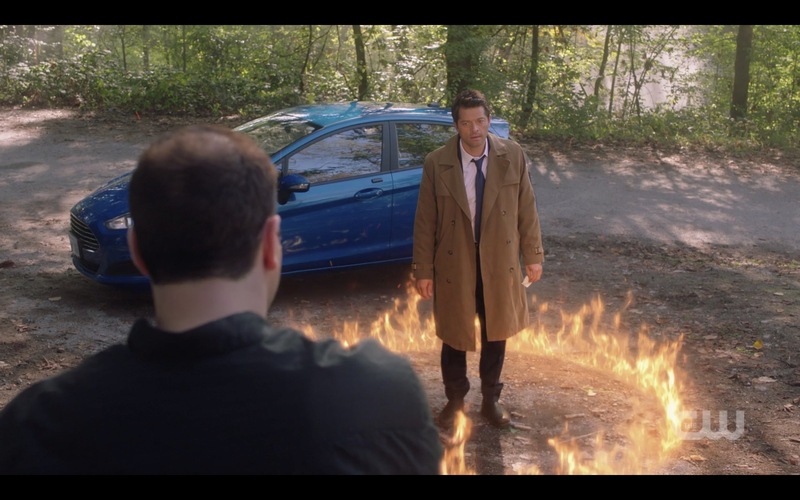 I am endlessly fascinated by what it takes to make a show like Supernatural. So it was with great anticipation that I scheduled a chat with Sanchez, who has done four episodes of Supernatural so far, not to mention the groundbreaking film The Blair Witch Project. And guess what? Our chat was even more fun and more fascinating than I had anticipated! (And not scary at all). 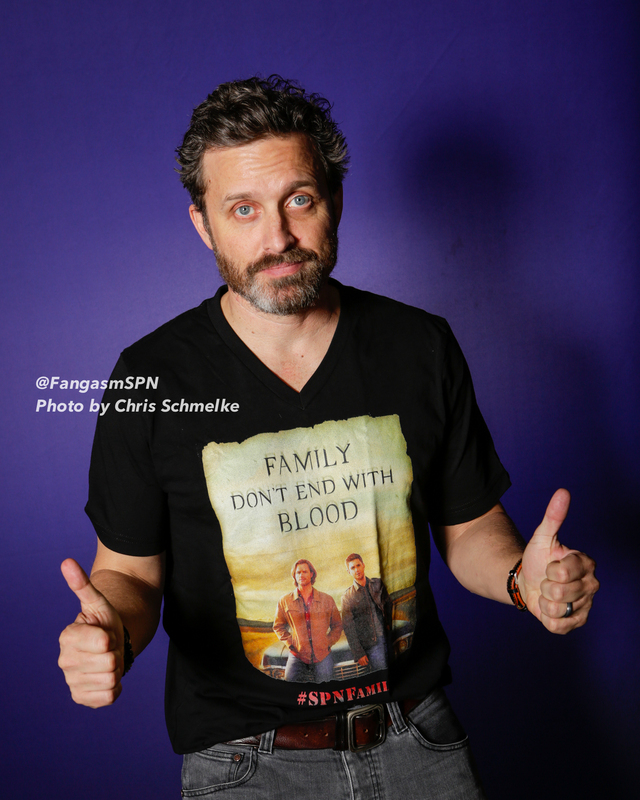 So sit back and relax and enjoy a director’s insights into the diverse episodes of Supernatural he has directed so far. Lynn: The first episode you directed is one of my all-time favorites, The Chitters. That’s partly because it introduces two of my favorite original characters, Jesse and Cesar (Lee Rumohr and Hugo Ateo), affectionately known in the fandom as the “hunter husbands”. Lynn: Written by Nancy Won, who I wish had stuck around on Supernatural, this episode was groundbreaking in its own quiet way. It was the first time Supernatural told a fully fleshed out story of two gay characters in such an organic and matter-of-fact manner. There were articles after the episode aired praising Supernatural for being “quietly progressive” with an interracial gay couple who are both hunters and heroes. Were you aware that it would be an important episode in that aspect? Eduardo: I didn’t know the history of Supernatural. I came in like the tenth or eleventh season, so it was impossible to watch every episode to catch up. But they told me that there hadn’t been this sort of thing in the show before, so we cast it really carefully and wanted to kinda ground it in not being stereotypical and just make these guys as real as possible and make their backgrounds as real as possible. At a certain point, yeah, I started to realize that this was an important episode. It was also just a fun episode for me – it was the first time I had done the show so I was nervous. The crew made me feel very much at home, and the guys were very friendly and welcoming. It was cool that we ended up bringing in these two characters who I know people really loved and I really loved bringing them to life. It was an all around good experience.